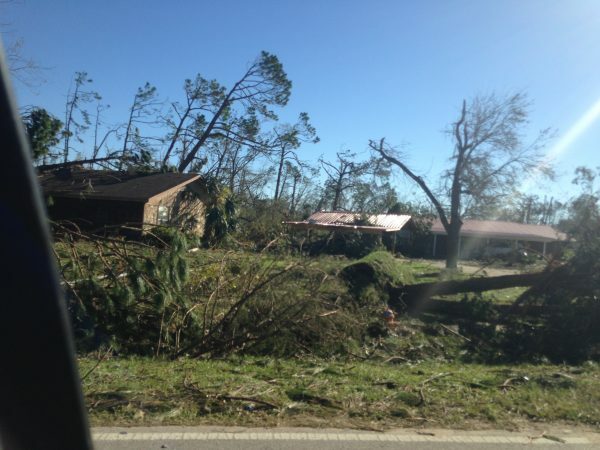 Whether it’s a hurricane, tornado, flood or a neighbor needing assistance with a storm damaged roof repair, the Florida Baptist Disaster Relief (FBDR) is willing to answer the call for help. In any well-run program, organization is key. FBDR is no exception. The hierarchy is simple. Florida is divided into seven disaster regions. White hats, blue hats, and yellow hats indicate who is responsible for specific functions. White hats are the State Incident Commanders who make the initial decisions and direct the tasks under them. Presently Delton Beall, a former pastor, along with Marvin Corbin hold these positions. Administration does all the paperwork from securing volunteer registration forms to tracking volunteer jobs and their hours at a site. This information is important because 25% of the value of volunteer time comes back to the county via a state funding program. Mass feeding mobile units (42 across Florida take 26 persons each to operate) cook the food provided by FEMA and pass it on to the Red Cross for distribution. In response to Hurricane Michael, one such unit produced over 10,000 meals per day. Cleanup and Recovery teams go out to individual homes and do mud-out, remove mold- covered walls, floors and ceilings while the buzz of chainsaws clear downed trees from roof tops and driveways. Temporary child care is available with state licensed attendants. E.R.T. (Emergency Response Team) provide security and emergency First Aid assistance. A Spiritual Christian ministry gives hope to survivors who are discouraged and feel forgotten. 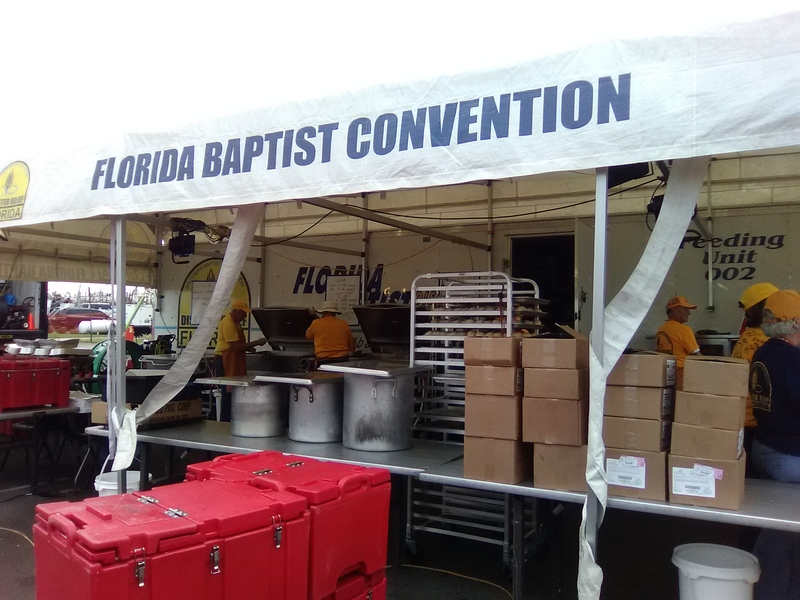 Florida Baptist Disaster Relief volunteers work to keep this feeding unit operational. Yellow hats are worn by the volunteer force who sacrifice their time, resources and physical labor to provide skills in many different areas. A command post may house folks from all parts of Florida. There are 7,500 trained men and women in the state who participate in FBDR and thousands more nationwide. They pay their own way traveling to and from distant areas. A disaster Task Force Center may be found at a local church, a community facility, a high school, or anywhere with a large parking lot that can accommodate heavy mobile units, trailers or equipment. For the past fourteen years, the Jack Grayson Panhandle Golf Tournament in Panama City, Florida has been held to raise money for disaster relief. To date, $300,000 of that money purchased and outfitted a public communication center, clean-up and recovery units, laundry and shower units, and a command center auxiliary supply truck. A flexible mindset is a must for a volunteer. “Expect the unexpected.” At Hiland Park Baptist Church command center, Vice-President Pence made a visit to observe relief operations after Hurricane Michael, October 25, 2018. When all is said and done, volunteers come away with a feeling that they have been blessed as much as the survivors. They see the tears of appreciation and hope in the eyes of men and women when they are told that FBDR is at their doorstep to help them physically and spiritually, and it’s not going to cost a penny. One team related a story of seeing an old man sitting on the back of his pick-up working on a small chainsaw not adequate to cut through the huge tree leaning against his porch. Within a short time, a team of men used their equipment and took the tree down for him. He was jubilant. 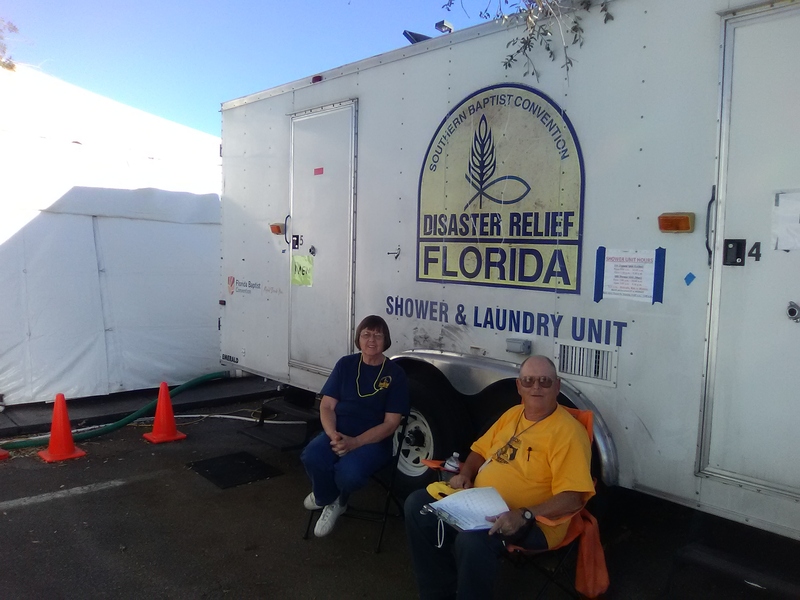 Florida Baptist Disaster Relief brings shower and laundry units to devastated areas. Another woman’s situation tugged at a team’s heart when she told them not only was her home in jeopardy, but her husband was in hospital dying of cancer and expected to live only a few days. Her appreciation brought tears to the eyes of those helpers. Seared into another volunteer’s memory is the sight of an elderly couple, one on oxygen and the other with heart disease, who sat in their home dazed as they waited for a tree removal team to remove a tree that had landed on their roof leaving a gaping hole. Another family tells how they huddled together in a laundry room expecting the walls of their home to collapse as the wind rattled windows and shook the whole structure. Fortunately, they survived. Why Do Volunteers Participate with Florida Baptist Disaster Relief? When asked the question, “Why do you come?” the answers vary. Chester Gunn received a call from a pastor in 2001asking him to go to West Virginia to help flood victims. Having never been to that part of the country and a first- time volunteer, he was puzzled why God was asking this of him. It appeared the staging area needed cooks, so that’s where he served. While here, Chester had the opportunity to speak to an elderly man who lost his wife six months previously and now his house had washed away. Chester told him, “God sent me here to tell you I love you and so does He.” After explaining salvation to the man, a few days later he came to Chester and told him he had invited Christ into his heart. That did it for Chester. He found his calling and to this day he’s always ready to serve when the call comes. 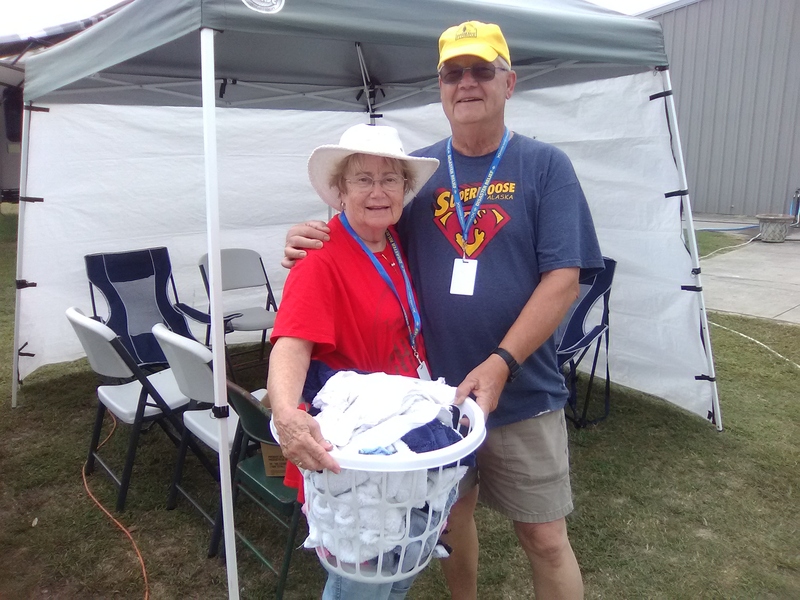 Sylvia and Al Melvin are passionate about bringing hope to others through Florida Baptist Disaster Relief. Sylvia Johnson has worked with the FBDR program on several assignments and feels it demonstrates the “Love of Jesus”. To her it’s like a family working together. Stephen Betts wants to give back because FBDR came to his community when it needed help. As each volunteer returns in the late afternoon an observer sees exhausted faces etched with satisfaction because another home has been gutted of mud and mold, and the message of salvation shared with another soul. Volunteers are not looking for recognition but work diligently behind the scenes. 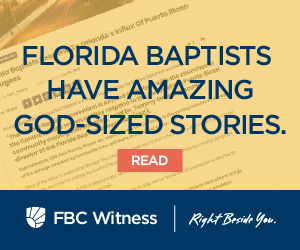 They do feel that the message of the program needs to be brought to the forefront of public attention so that many churches in the Southern Baptist Convention can recruit volunteers. Training sessions are available throughout the year. The need is great and volunteers are the hands and feet of Jesus. By Sylvia Melvin, a member of Pine Terrace Baptist Church in Milton and a devoted Florida Baptist DR Volunteer.